I'm not a prolific blogger. I love to write, but I'm also pretty much constantly on the go doing something so carving out time to actually write about it is an infrequent event. 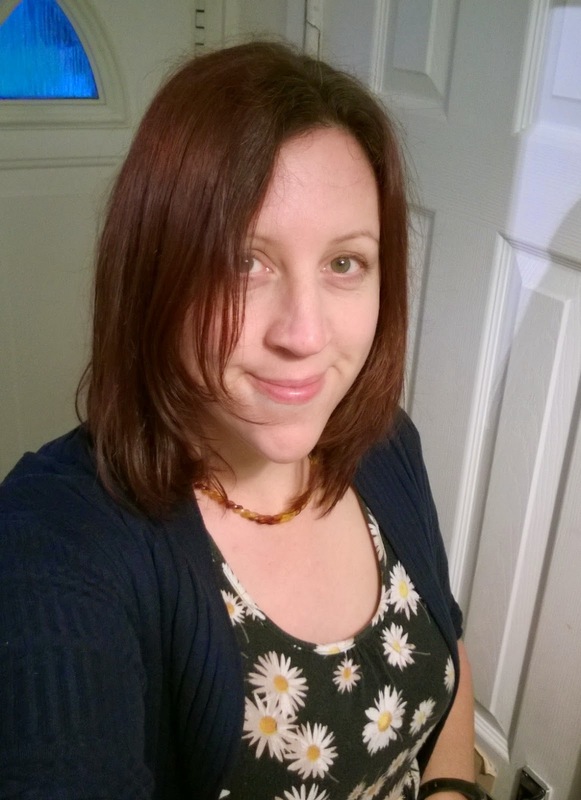 I thought I'd do a bit of a summary of the kinds of things we've been up to in the past week as an insight into how it works for us doing the home ed thing (including the constant query of 'but what about socialisation'). The egg parachute experiment, from a lovely gift courtesy of my sister in law, was a high point of the week. We tested the drop rate and breakage of eggs with and without a parachute. I put the eggs in a plastic cup with clingfilm over the top so the one that did break was contained and swiftly used up to make a cake. The boys all had a brilliant time designing and constructing their plastic, straws and elastic cord eggstravaganza (sorry). We went to see the brilliant story teller at Tales for Tots at the Delaware Pavilion in Bexhill, then round the fab display of artwork from ladybird books of the 60s and 70s (which as an 80s kid I remember well) and then to the library for a new stack of books. 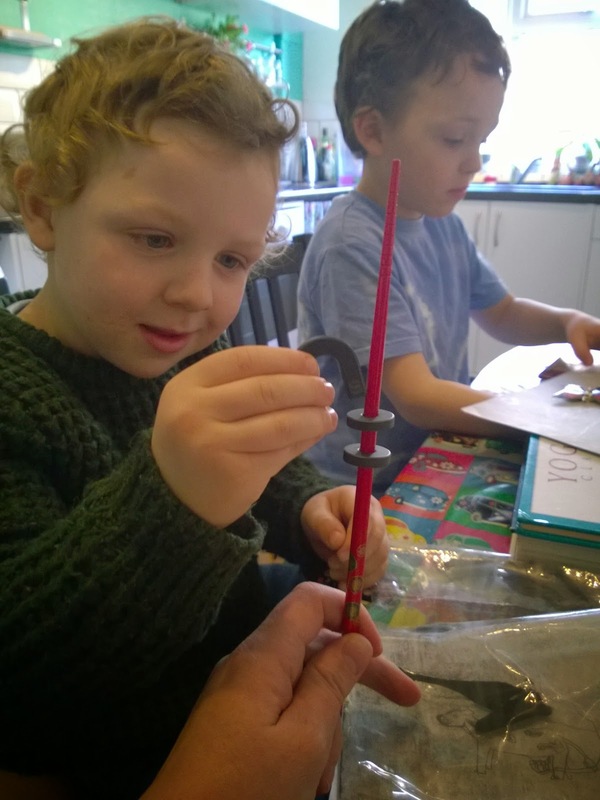 This week we played with magnets. 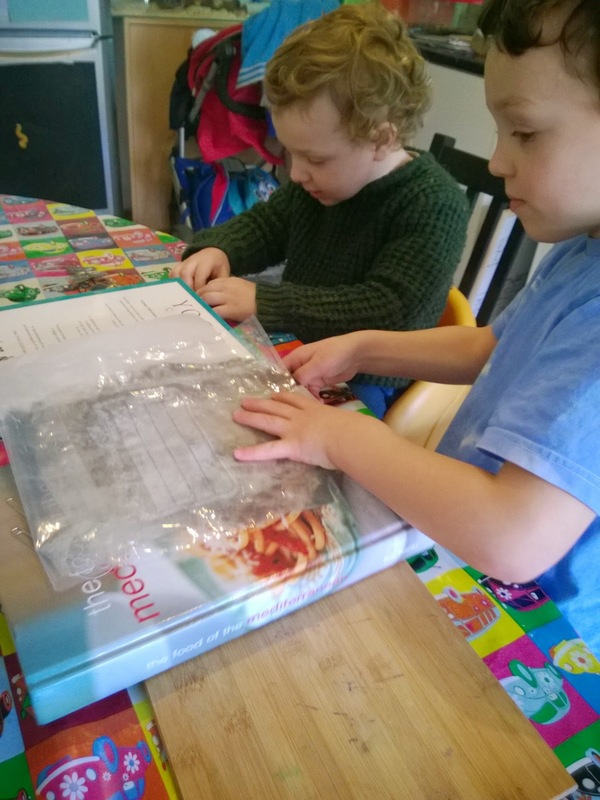 I tipped the iron filings from my old magnets kit (a cheap supermarket science kit I've had for years) into a sandwich bag and taped the edges shut so the boys could play with them without getting filings stuck all over their magnets. The boys were fascinated trying out different magnets on the filings and making them swirl around. Ollie decided to tape the bag flat to a table mat to try to make a magnetic drawing board. 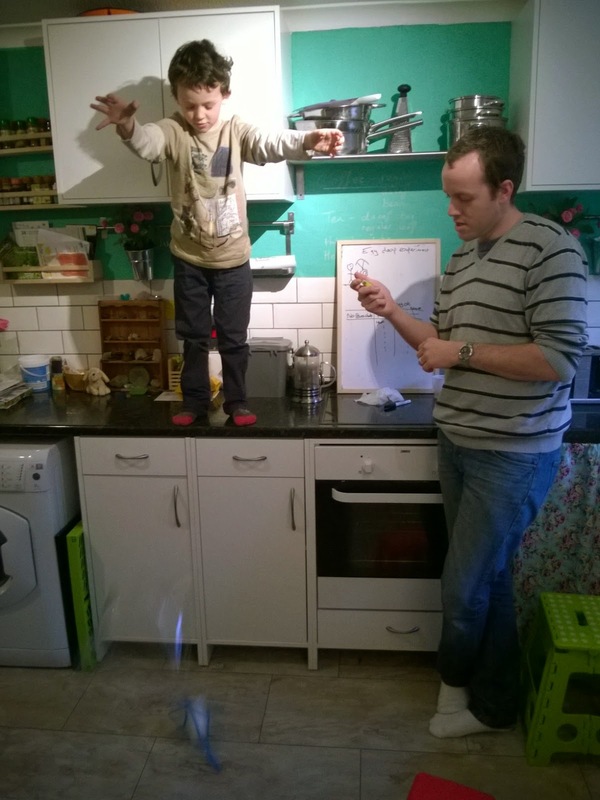 Toby's favourite was when I put ring magnets on to a chopstick - one way up they stuck as he expected, but the other they bounced up and down, levitating beautifully. 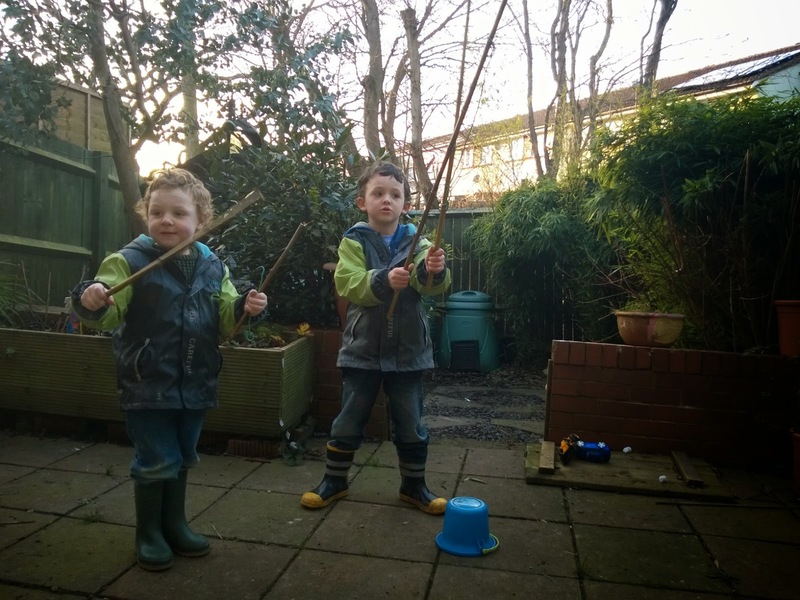 We had a lovely afternoon just mucking about in the back yard enjoying a relatively warm day, decorating the shed with chalk, drawing roads and car parks on the patio in chalk to push card around, drumming with sticks and making up songs, and finally a funny game they came up with to try to catch an eagle using sticks and garden ties. Eagles are not a thing I've seen in Hastings before, but they gave it a good go, even trying to use Toby as bait. We had a fun morning in the park with our friends who had brought along spotter sheets of seasonal things to find, enjoying a good run around and looking out for the things on the sheets including squirrels, birds and even deer poo. Then we spent the afternoon at children's yoga with some more friends, stretching and dancing and laughing. We spent a morning at the sign and shine Makaton group for children with speech delay that we help with, played with old friends and made some new ones. Then we had gymnastics lessons in the afternoon where the boys also get to play with their friends. 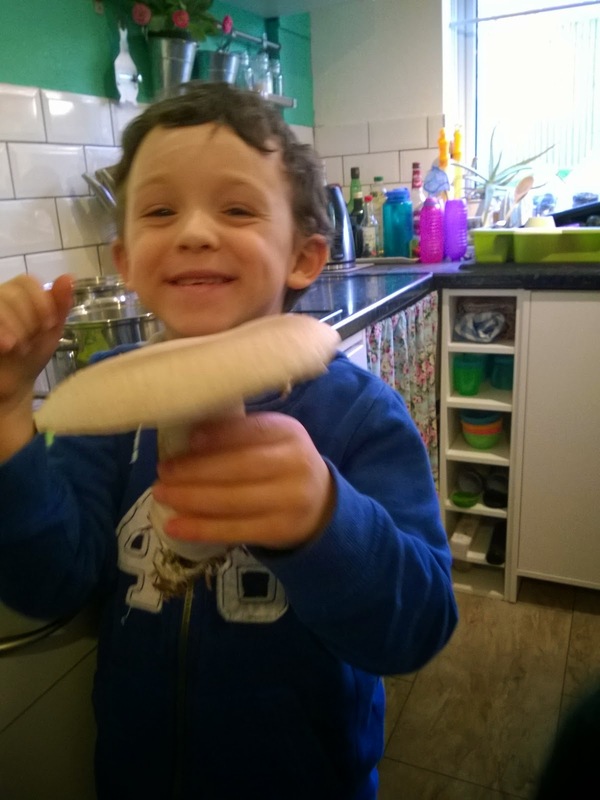 This week the kids discovered they had grown the biggest mushroom ever because we had forgotten to check our mushroom box growing in a cupboard. 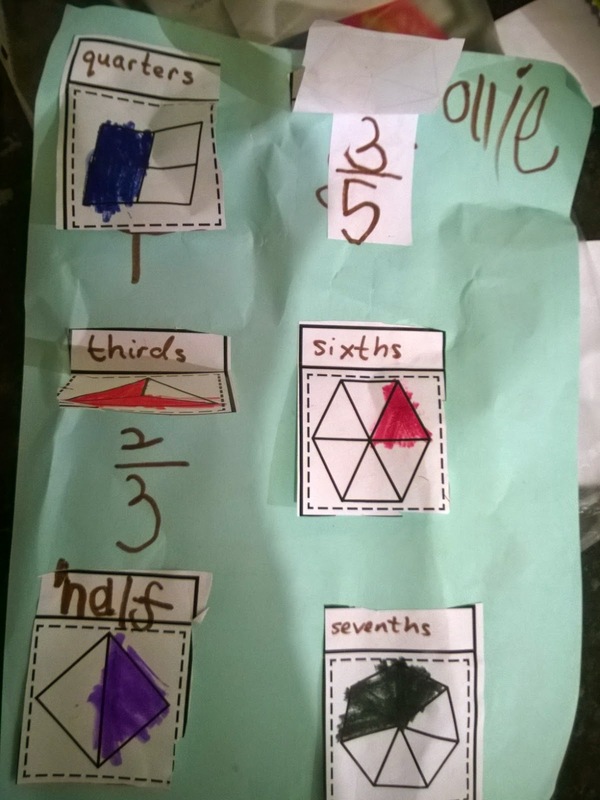 We went to a one off maths fun session this week and met some other lovely home educating families. The session was taught by a private school teacher who had home educated her own kids and she really knew how to engage with the kids. Ollie was one of the youngest, but seemed to grasp everything straight away and begged to go back so hopefully these sessions might become more regular. I was glad it was in a hall because it meant I could send Ollie to run around it every so often to burn off his jitteriness so he could sit back and concentrate again for a time without bouncing off his chair. Matt took the day off to spend time with Toby scootering along the seafront while Ollie and I did the maths, so I made the most of the extra pair of hands afterwards by getting my hair cut (at an actual salon, as opposed to just getting Matt to trim off the bits my hairbrush got stuck in). We played loads as usual, and painted, drew, did workbooks for phonics, maths and science. We went to a friend's birthday tea one morning, and then Matt took the boys to a swim disco while I sat by the pool and worked on my next University assignment. They met some friends there who have ended up being home educated too. 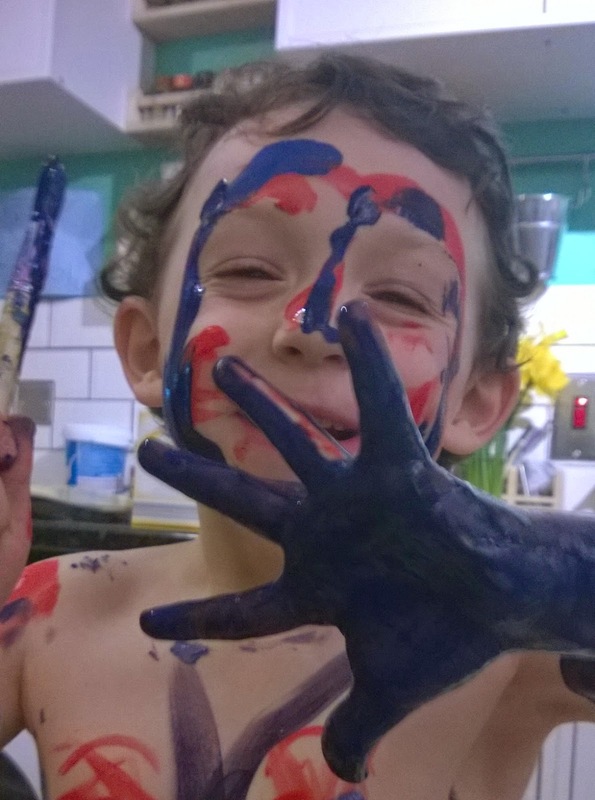 At home the boys got experimental with paints. The shower curtain and bath are still blue from trying to wash the paint back off again. We've cooked together, played instruments, done housework together and made the house messy again several times. Toby is majorly into space at the moment, so we've been reading a lot about it. Matt found great footage of astronauts showing around inside the ISS, then Matt used an app to track the ISS going over our house and the boys stood out in the garden to watch it - this caused a huge amount of excitement. Other topics covered as they came up this week included why people speak different languages, where in the country and the world our friends come from, what's religion all about and why do people believe different things, crash tests of airbags, why isn't it that all ladies have long hair and all men have short hair, why are people's skins different colours, why don't ladies have the same bits as men, why do some seeds grow two leaves and others just one (seriously, I'm having to explain dicotyledons and monocotyledons to a five year old), why are some words rude and not others, what nutrients are in different foods ...... (my brain usually starts to ache pretty early on in the day - science I can cope with, but the whole of the reasons and details of world religions at 7.30am is hard going). Today we had a lovely pancakes morning followed by a super fun science session organized by the Hastings Pier Charity where we learned about gross body stuff, including making fake poo and blood. This afternoon Matt and the boys planted up potato growing sacks and built a mini grow house on the patio to house our seedlings for the allotment. Each and every day we have read together both during the day and at bedtime, plus some time watching Cbeebies and a heap of other games and activities that the kids entertained themselves with while we did washing up.